User interface language: Change the language of the application interface. 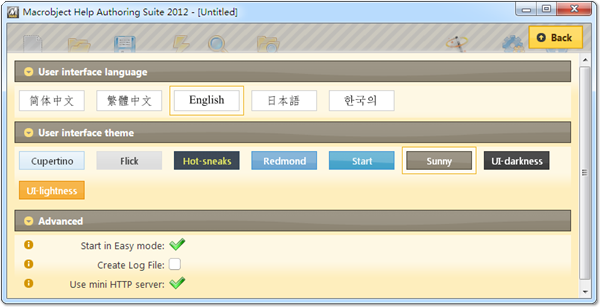 User interface theme: Change the theme of the application interface. Start in Easy mode: Enter the easy mode when Help Authoring Suite runs. Create log file: Create log file for the build process. Use mini HTTP server: Use the mini HTTP server for displaying web helps and web sites. All created web helps and web sites work well both with and without a web server. The only difference is that the bookmark function of the web helps need a web server.